Do you have hundreds or even thousands of music albums on your iPhone or iPod touch? If so, you might be neglecting some of your music and the folks at tapku are here to help with their new iPhone app, Attic. Think of the Attic app as a smart jukebox with a beautiful interface, that can help reintroduce you to your large music library. 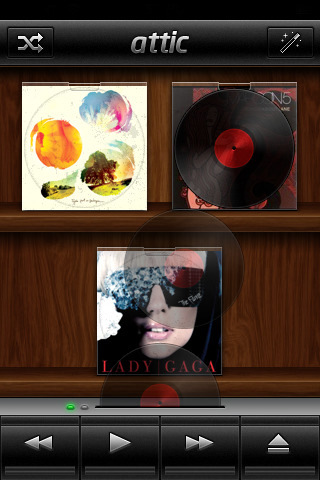 Attic uses internal logic such as the number of times you have skipped a song, played it (or not), and metadata information within the song to select 15 albums and sitting on a beautiful scrollable wooden shelf portrayed as classic records using your cover art. When you first start the Attic app it looks through your iPod library and generates the 15 album list. The Attic interface -probably its best asset- is composed of polished retro dark wood shelving and walls (similar to the Delicious Library Mac app), and the control buttons are reminiscent of an old record player or tape deck. To play a specific album, tap and hold on its cover to reveal a record icon, then drag the record to the bottom loading slot where it starts playing, even making a neat little loading sound. If you prefer, you can also tap the wizard icon on the top right and attic will start playing a random album. You can also choose to shuffle the Albums in your attic or play them continuously. On the bottom of attic there are its four main controls for play, next, previous, and eject. Currently playing songs are shown with a red ribbon on top of the album cover. If any of your albums have missing artwork, Attic sticks a slick note on there with the Artist and Album title until you get around to grabbing the cover art for your files in iTunes. Double tap any album to see the behind the scenes meta information such as the number of songs in that Album, their play count, skipped count and last played days. Currently there is only one option for Attic tucked away in the iPhone settings section, which is for reindexing your library each time you start the Attic app. Enabling this can be good if you keep changing (adding/removing) your list of iPod synced music files and want attic to update its 15 albums each time you launch the app. Although Attic is brilliantly designed and very easy to use, using it is limited to random selection which may or may not be what you’re in the mood for at the time. Given its amazing controls and design it would be great if it was possible to choose albums and songs you wanted to play as an option. If you are a sucker for beautiful design like we are, the Attic iPhone app is a must have. We think Attic can benefit by expanding its functionality to include open-ended manual playlist management as an option, but is nevertheless great iPhone software. The potential for Attic on the iPad is also huge given the iPad’s larger screen and better processor. We can’t wait to see what tapku does with Attic on the iPad. AppSafari review of Attic was written by Joe Seifi on March 8th, 2010 and categorized under App Store, Music, Utilities. Page viewed 4290 times, 3 so far today. Need help on using these apps? Please read the Help Page.